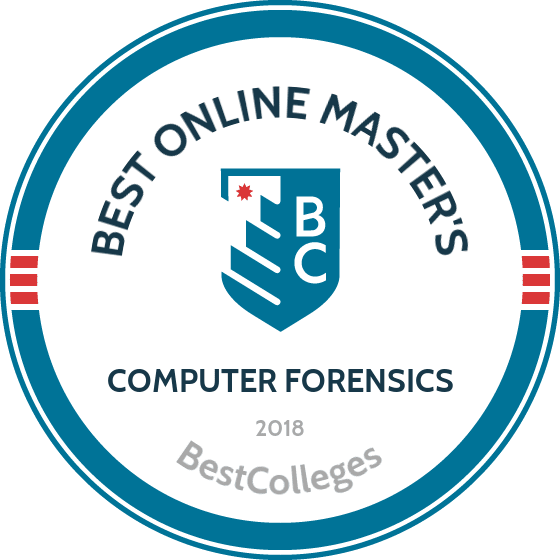 What Are The Best Online Master's in Computer Forensics Programs? What Else Can I Expect From an Online Master's in Computer Forensics Program? If you enjoy using cutting-edge technology to work through complex problems, or if you are interested in criminal investigation and cybercrime, a master's degree in computer forensics would be a great fit. The Bureau of Labor Statistics projects a 27% increase in forensics positions by 2024, a growth rate well exceeding the national average. Online computer forensics master's programs teach students to be effective investigators. Students learn methods to safeguard important information from cyberattacks and skills to aid criminal investigations at the local, state, and federal levels. Graduates with a master's degree in computer forensics often specialize within the field and are competitive applicants for upper-level positions. With the largest undergraduate enrollment in the nation, University of Central Florida in Orlando, FL provides students an abundance of learning resources. The school now offers robust distance education programs, including an online digital forensics MS (MSDF) program. The online computer forensics master’s program is a collaboration between UCF and the National Center for Forensic Science (NCFS), which is based in Orlando’s research park. The program boasts expert faculty members who also have extensive practical experience in the field. This online digital forensics degree is completely online; students never need to visit campus. Graduates are prepared to be leaders in digital forensics examination and forensic tool development fields. All applicants to UCF online must submit a GRE or GMAT score to be considered. Located just outside of Baltimore, MD, Stevenson University offers an online computer forensics master’s degree that requires 36 credits to complete. Online students in the cyber forensics program complete their program through eight-week courses. A single eight-hour on-campus residency is required for a mobile device forensics course, in which students acquire mobile devices with modern industry tools. In addition to the residency requirement, the program includes a unique mock intrusion and response capstone experience, and end-to-end simulation of a case as a forensic consultant. Stevenson students also benefit from the on-campus Center for Forensic Excellence, which keeps students abreast of current industry trends and best practices. All applicants must have earned a 3.0 undergraduate GPA and at least two years of relevant work experience to be considered for admission. Applicants without a cyber security-related undergraduate major must have five years of relevant work experience. The University of Maryland - University College’s online MS in digital forensics and cyber investigation program is a 36 credit degree offered entirely online. Students complete a total of six courses, including studies in advanced forensics, digital forensics technology and practices, and a capstone experience, in which students take on the role of a cybersecurity professional. Students also have the option of pursuing one of four industry certifications, including the Certified Cyber Forensics Professional (CCFP). Graduates find cybersecurity work in the government, the private sector, and law enforcement agencies. Coursework is delivered asynchronously, and the program’s faculty members boast a wealth of experience with high-profile cyber security agencies. Students in Champlain College’s online MS in digital forensics program never have to set foot on campus in Burlington, VT. The program maximizes student flexibility with six start dates throughout the school year, and asynchronous coursework students complete at their convenience. The 30-credit curriculum includes studies in mobile device analysis, digital investigation, and a capstone research thesis. Degree-seekers who take two courses per eight-week term finish the program in exactly 12 months. Graduates of the program work as FBI agents, state attorneys, police officers, and consultants. Applicants to the online computer forensics master’s program should have earned an undergraduate GPA of at least 2.5. Prior work experience in digital forensics, computer crime, or evidence acquisition/handling is preferred. Chaplain also takes a holistic approach to evaluating applicants, ensuring that students have demonstrated aptitude for graduate education and success in online learning. Utica College’s MS in cybersecurity with a concentration in computer forensics program prepares students to work as forensic computer analysts. Within the field, Utica also prepares its graduates to specialize in a specific area of cyber crime. Cyber crime is wide-ranging, and as a result, potential degree specializations include intelligence, computer forensics, cyber operations, malware analysis, and electronic crime. The 30 credit curriculum contains a diverse range of courses with plenty of electives, including fraud management and technology, cyber conflict, and cyber data fusion. Utica students can add to their online computer forensics master’s degree by completing one of five computer forensics certificates, including the Certified Computer Examiner (CCE). All applicants to the program should have earned a minimum 3.0 undergraduate GPA. Typically, students take two courses per term and complete the program in 18-20 months. Online computer forensics master's degree curricula vary by program. Examine each prospective school's course offerings and faculty to choose the best program to help you reach your academic and professional goals. Course offerings vary depending on the school's faculty, departmental history, specialties, strengths, and geographic location. These factors are important to consider, as some programs prepare graduates for certain types of work in the field. Below are core courses that are common to most forensics master's programs. Digital Crime, Evidence, and Procedure These courses cover basic legal concepts that help students navigate investigatory situations and crime research. Students explore the practical application of laws in the age of digital criminal activity. Foundations of Computing and Security This introductory course explores online network analysis, routing protocols, and software and hardware risks. Students examine the complex nature of online data and security protocols. Electrical and Computer Engineering This course covers electric circuit theory's function within digital forensics. Students learn about basic electronic components of field equipment and conduct lab experiments. How Long Does it Take to Get an Online Master's in Computer Forensics? Full-time students typically complete their online computer forensics master's degree in about two years, although it could take longer to complete the required 35 to 40 credits. Some programs require students to compile research portfolios throughout their studies and to present a final project. Alternatively, a master's thesis or capstone project may be required. Some programs allow students to enroll part-time, in which case additional time is typically necessary to complete all degree requirements. Some online digital forensics master's programs feature a cohort learning style, while others employ an individually paced structure. In cohort-based programs, small groups of students follow the same schedule and adhere to synchronized deadlines. The cohort style fosters a strong sense of community and often includes interaction and collaboration. Students in individually paced programs complete coursework according to their own timelines, as it fits into their personal schedules. Schools may be nationally or regionally accredited. National accreditation is often awarded to career-focused vocational or technical institutions. Regionally accredited schools are usually four-year institutions that offer associate, bachelor's, master's, and doctoral degrees. While regional accreditation is the more prestigious of the two, both accreditations are significant. Accreditation means the institution has met or exceeded applicable educational standards. While there are six regional accrediting agencies in the United States, various third-party agencies accredit programs in the forensic sciences, including the Forensic Science Education Programs Accreditation Commission. Specialized accreditation helps students identify high-quality online computer forensic master's degree programs. The U.S. Department of Education (ED) creates and enforces policies and laws that improve the country's quality of education. While the ED tracks accreditation records and collects data on educational institutions, the department has no control over the accreditation of institutions. The Council for Higher Education Accreditation (CHEA) ensures that accrediting agencies are held to high standards. For more information, visit the ED and CHEA websites. Professionals with training in computer forensics succeed in a wide variety of fulfilling careers. Graduates of master's programs pursue positions in laboratories and assist crime specialists in the analysis of evidence and data. Others pursue technology-based and securities-based careers with large organizations. Computer forensics professionals have excellent communication skills, are detail-oriented, and possess nuanced problem-solving skills. They must also be sensitive to the graphic and personal scenarios, documents, and evidence they encounter. These technicians aid in criminal investigations by collecting and analyzing evidence in laboratory settings. These professionals explore and invent new ways to use technology. They work in fields including forensics, business, and medicine. While a PhD is required for some advanced positions, graduates with a master's degree often secure positions in the federal government. Forensic analysts examine digital information connected to cybercrimes. They protect compromised data, recover files, and handle important evidence. Advanced positions require a master's degree and programming expertise. These professionals design and execute security measures to protect computer systems and networks. They monitor networks for security breaches and test networks for weaknesses. Often called IT managers, these professionals plan and direct computer-related activity at institutions, laboratories, and businesses. They ensure that all tasks that rely on computer systems are effectively carried out. A master's degree and experience are critical to advancement. The table below compares the media salaries for four forensics-related careers. All but one of the career paths display steady salary growth over a 20-year career; experience consistently increases the earning potential for forensics professionals. Every student should complete and submit the FAFSA in order to be considered for federal financial aid, including scholarships, grants, work-study programs, and loans. Scholarships are the most desirable type of funding; unlike loans, scholarship funds do not have to be repaid. Work-study programs help students secure part-time work during their studies. Various organizations offer external funding for forensics students, including the Association of Firearm and Tool Mark Examiners and the American Society of Crime Lab Directors. Check with your school's financial aid office or forensics department to locate the best options to fund your education.